The world’s fastest growing electric car company made their way to the eCenter this past Thursday to give an awe-inspiring look into the future of the automotive and renewable energy industry to LEAP students and alumni. Representatives from Tesla captivated us young entrepreneurs with a brief presentation about the short history of the company, its products and plans for the foreseeable future. In addition to the presentation, we were able to experience and sit behind the wheel of the Tesla Model S Sedan and the Model X SUV which was an undeniably extraordinary experience. The cars themselves were near, if not completely silent while stationary and in motion along with an elegant design with every detail meticulously engineered to perfection inside and out it was undeniable, this is the future and it’s here. Being the forward thinking company that they are, Tesla recognizes the importance of including and educating today’s youth about what exciting prospects are on the horizon and that they too could be the next Elon Musk. The eCenter specializes in the latter by carefully crafting students in LEAP into budding entrepreneurs as well as startups into full-fledged, sustainable businesses. 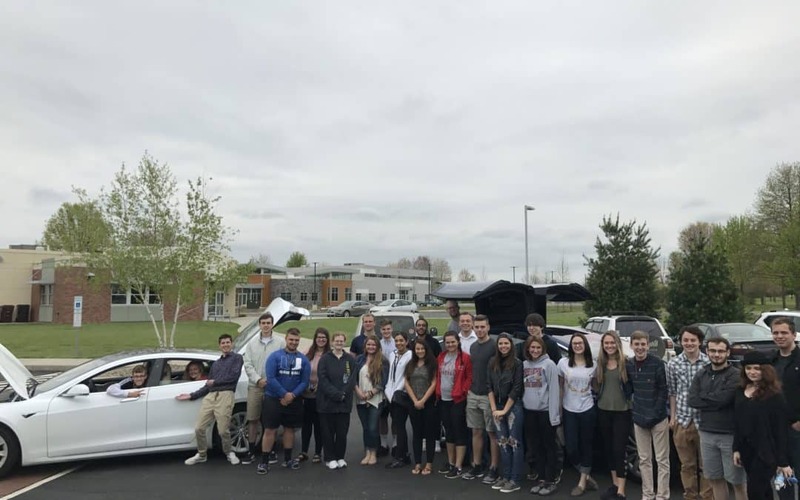 The culmination of these ideas was a rousing success, us students were engaging with the Tesla Representatives by asking an array of individualized questions ranging from specifics on the lithium ion battery that the car is powered by to what a typical day working for Tesla looks like. The representatives were so impressed they even asked one alumni if he would send in his résumé! The presentation given was partially devoted to the new Model 3, which is starting production towards the middle of this year and is their most affordable model to date. With the price of the original Tesla Roadster being $109,000 and Model S being $68,000, the Model 3 is set to cost around $35,000. The dramatic decrease in the price of Tesla cars is made possible by two key factors: State of the art production facilities that will be completely autonomous and increase production capabilities in anticipation for the Model 3 and the Gigafactory, which when completed in 2020 will account for more than 30 percent of the global lithium-ion battery production along with being the largest building on Earth! The capabilities of the Gigafactory allow a reduced price for all of the massive lithium-ion batteries that are the core component on electric vehicles. Tesla is transforming not only the way we think about transportation but renewable energy as well. The representatives offered a look at the house of tomorrow as Elon Musk sees it: Solar Roofing that is akin to traditional shingle or slate roofing aesthetically, with the exception of having the same capabilities of solar panels. A Powerwall that will act as a home energy storage system that can seamlessly be integrated with the Solar Roof. The combined capabilities of these innovations can more than meet the power needs of the modern household in addition to charging a Tesla or other electric vehicle. Both of these innovations will be in production by the end of the year. This self-sustainability home model combined with the potential of 100 Gigafactories being able to power the Earth, Tesla and Elon Musk certainly make the future something to look forward to.